One of the pleasant surprises of this Austin trip was how many dear friends we were able to meet there. I’ve already told of how we got to spend time with Steve, in spite of the fact that he lives in Florida. And weren’t really surprised by the chance to spend time with Adam, because he lives in Austin. But we were surprised when Adam told us that his parents were coming through Austin on Sunday evening, and we happily made plans to join them for dinner at Hoover's. We didn't try to draw Frances and Elliott completely into our habits of sharing everything equally, but they did fit right in with our Roadfood group, cheerfully sharing their own plates and sampling ours. I think the most exotic choice of the evening was Amy's drink selection: the beetarita. A margarita made with beets could be anywhere from very good to horrible; this turned out to be pretty good, but there are some good reasons that the beetarita is not as popular as its lime-flavored cousin. 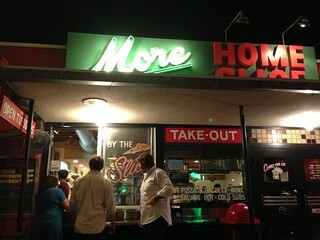 I was skeptical of the smoked hamburger, because a hamburger usually wants to cook too quickly to pick up much smoke. But this smoked hamburger really did have a nice smoky taste. The candied sweet potatoes were super sweet. Fried catfish, flanked by fried okra, porky green beans, and bacon-laced mustard greens. Chicken-fried steak, flanked by black-eyed peas, mac and cheese, and jalapeño creamed spinach. Chicken fried steak may be one of those foods that I like more in my imagination than on my plate (haluski is another). Although this was a very good chicken fried steak, it didn't satisfy my desire for a chicken fried steak against which all others would fall short. Frances and Elliott did join us in sharing all the desserts. The peach cobbler was my suggestion, and again it wasn't quite what I wanted it to be; it was topped with a pie crust, and I much prefer a biscuit crust on my cobbler. The pecan praline bread pudding was probably the best thing we ate at Hoover's. 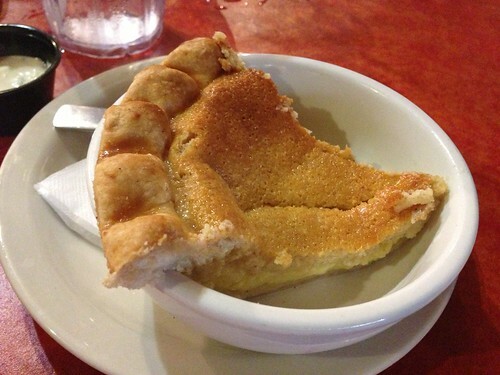 I think we were all surprised that the buttermilk pie was served in a bowl. The filling was good, but my notes say that it was "a little strange" (without providing details, unfortunately). The crust was only so-so. The banana pudding cheesecake was very good, but not nearly as good as the banana pudding we'd had at the Driskill. I don't recall who suggested miniature golf after dinner, but it was a lovely suggestion. I love mini golf; it reminds me of summers with my grandparents and and simpler times that may or may not have actually existed. 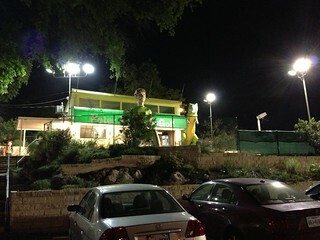 And Peter Pan Mini Golf turned out to be a nice course, with some interesting holes and funky statuary. I would have been most delighted if it had had a motorized windmill, but it is nigh impossible to find a motorized windmill in mini golf these days. It was a great pleasure to play a foursome on a warm evening, and I hope that everyone else was as happy as I was. It took us a bit of looking to realize that this statue was depicting an armadillo atop a lone star atop a mustang's head with a cowboy hat flanked by a pair of cowboy boots. It's hard to get much more Texan than that. I may have won the match on points, but Lori gets the glory: she got two holes-in-one in eighteen holes! 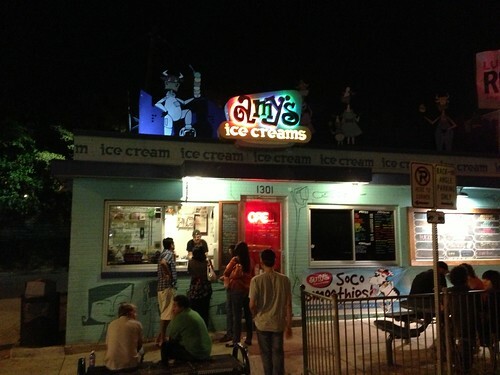 After that, a warm summer night called for ice cream, so we went out to seek a location of the local chain Amy's. Although we had enjoyed Amy's ice cream at non-Amy's locations, our blackberry ice cream with cake mixed in was a disappointment, because it had large ice chunks. Although we'd had a full day of eating, Chris incited us to just one more, because he noticed that near Amy's was Home Slice, which he had read to be the best pizza in Austin. 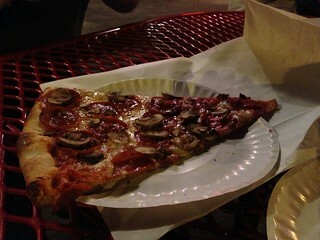 I don't have enough experience of New York pizza to judge this slice by NY standards. It was flexible and a bit messy, but it was satisfying in a late-night way.